I heard “If You Feel” on the radio tonite, in the car, as I sailed down the 101 freeway, windows open, volume jacked up all the way to eleven. It’s not a song you hear much, but I love it, love the way the drums drive the thing, carry it aloft, make it happen. When I got home I listened to the tune again, then remembered this obituary. It was the summer of 2005…. Spencer Dryden died the other day. Cancer and other things. He was 66. Spencer Dryden played drums in Jefferson Airplane. And he was my favorite rock drummer. Or listen to the live version of “3/5’s of a Mile In 10 Seconds” off Bless It’s Pointed Little Head: Spencer Dryden kicks in with a slamming pair of strokes, then–listen carefully–he takes it down to just about silence, almost air, the faintest pulse of syncopation, and then he brings it back up and kicks the song off with one of his staggered breakbeats. Just a tiny passage of time, really, a pregnant couple seconds, but to me it always seemed to last forever. One of those looming empty spaces. It’s a kind of dynamics one doesn’t hear much in rock, where changes come in with the downbeat, orderly, squared off, neat. Spencer Dryden dug the fact that the beat is there, the rhythm there, always there, in silence even, and a drummer in a rock’n’roll band who digs that can play around it, slide across it, wax and wane and then come in solid, hard, on beat for emphasis, for finality. After Bathing At Baxter’s is the Jefferson Airplane’s masterwork, their Blues and the Abstract Truth, a record based on some simple themes that, stretched out, arranged, re-imagined, turn into something much much more. Spencer Dryden is all over the thing. He opens the album doing an inside out blues beat, goes into some strange thing of his own that quotes at “Blue Monk” (you have to listen closely, but it’s there); lays down angular shuffles, oddly placed accents, tight little fills and gutbucket behind the beat straight rock riffs. Cymbals splash or sizzle in the background; he was never a loud drummer, and his cymbal work was always subtle for a rock band. But he was an active drummer. His bass pedal danced around, he nervously popped and brushed his sticks over his snare, dropped little bombs on his toms, worked out figures and ideas and stories. Like a jazz drummer. In a rock band. No Blakey or Big Sid Catlett or Elvin Jones, obviously. But he took a lot of those jazz ideas and put them into a rock music framework, and made it sound natural. Baxter’s ends with the anthemic “Saturday Afternoon”, which Dryden takes as a dirge, a funeral march, then doubles, drops in accents and cymbal crashes. Cymbals and feedback and three part harmony carry it away, to silence and finality. Spencer Dryden got down. Not the first time you know. He got down, but got up to go. And he’s gone. 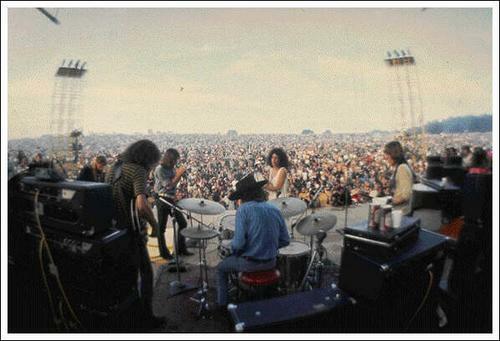 Happier times…the Airplane at Woodstock . This entry was posted in Psychedelic and tagged Jefferson Airplane. Bookmark the permalink.